The help-desk solution provider Zendesk.com commissioned a survey about the importance of customer service. You can see the full results in this Infographic. What they found, which will be a surprise to no one, is that customers are more likely to buy from a company where they receive good service, and will stop dealing with those who let them down. Hardly worth the cost of the survey so far. What is more interesting, and what should resonate with call centers and every type of business, is how profoundly people are affected by a positive or negative experience, and the long-term impact of that lone encounter. Nearly 25% of respondents stayed with a company that treated them right for two years. And nearly 40% stayed away from a company that did not deliver acceptable service. Which type of customers are the worst ones to upset? Those with higher incomes are the last ones you want to tick off – according to Zendesk, almost 80% will likely be lost for good. Makes sense, as these are the customers with the most flexibility in where they can do business. Younger consumers – those that are part of Generation X, are also less forgiving. Finally, the survey revealed that a positive or negative customer service experience could affect other existing and potential customers as well. Social media has opened up a number of channels for consumers to voice their displeasure, or to recommend a product or service to their friends. Bad news usually travels faster, and that’s the case here. 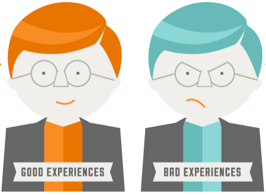 The survey found that an extraordinary 95% of survey respondents would share information about a bad experience with others, while 87% would share the results of a positive business encounter. So next time you have a training session with a call center agent, add a reminder that the service provided to one customer can impact that customer’s friends, family and the hundreds or even thousands of people connected to their Facebook or Twitter accounts. A little courtesy goes a long way. A little rudeness goes even further and has even more negative impact. In addition to training, you should consider using call recording and quality management tools to monitor and improve customer interactions as an ongoing effort.